There are many ways to verify alignment but only one stands out as the most convenient to use. The PARALLEL is a small, battery powered, very carefully aligned laser beam projector. Used with the supplied reflectors, it becomes a very clear and simple to understand alignment indicating system. Accuracy of alignment is determined by the position of the red reflected laser dot. If everything is parallel, the red dot is reflected back to the center of the target. Misalignment becomes obvious if the dot is anywhere other than the center of the target. The progress of corrective adjustment is easily followed by watching the position of the dot as it moves in response to the changing alignment. The PARALLEL is accurate. 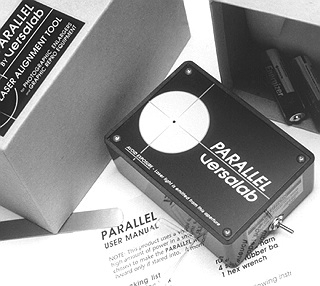 The dot reflection system of the PARALLEL magnifies any misalignment. If a 35mm negative stage is out of alignment by as little as the thickness of the film, the dot will miss the target aperture by over 1mm. Supplied with the unit are several precision glass reflectors. The smaller reflectors are for use on the front of lenses and in negative carriers up to 6 cm x 17 cm. The larger reflector fits into 4 in. x 5 in. negative carriers. Negative carriers up to 8 in. x 10 in. can be accommodated by the inexpensive optional 8x10 adapter. If you want the best product for enlarger alignment, get the PARALLEL.